Before you read this, I want you to know that I'm not just some do-gooder on the Internet that doesn't understand what it feels like to be immersed in a dark hole so deep that you cannot remember the last time that you saw any light. 20 years ago I was in a deep depression, and I tried to take my own life seven times. My final attempt to take my own life was nearly successful. 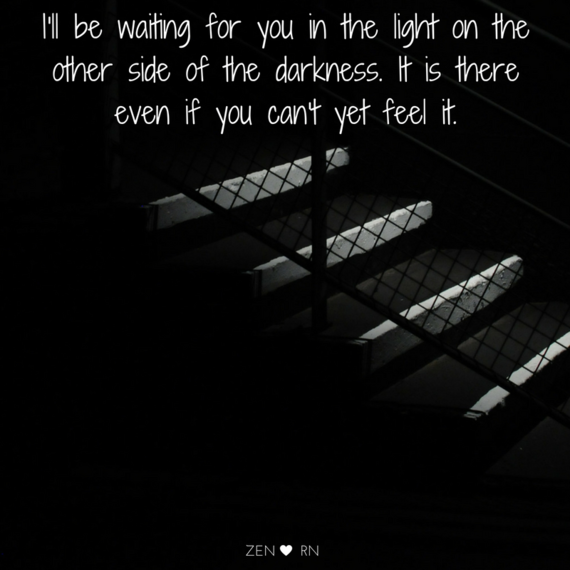 So I've been in the deep dark place that you might be in now. I know that the fight for your own life, the fight to stay out of the pain which is unbearable, is a moment by moment fight. I'm here to tell you that your depression is a liar. I'm here to tell you that there is life beyond this pain. 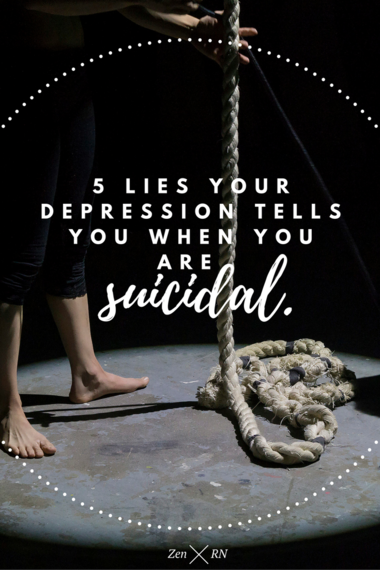 I'm here to tell you all of the ways that your depression and your suicidality is a grievous liar. You mustn't believe the lies for a minute longer. 1. )Your life is already over. How could this even be true? Are you still breathing? Is your heart still beating? Then you are still alive. And, your life is NOT over. It may feel as though you've screwed up beyond repair. I'm here to tell you there is no such thing as a life beyond repair. You may have messed up so royally that you believe that no one will ever forgive you. But there is life beyond this pain and there is life beyond whatever mistakes you have made. Please top believing that you are the only one that makes mistakes. Even the most wonderful person that you know has made a big, huge, grievous mistakes. No one is perfect and no mistakes that you have made cannot be overcome. 2.) Your loved ones are better off without you. This one might be the biggest lie of them all. If you left this earth, especially if you left this earth by your own hands, you would create a hole in this world and a hole in your loved ones hearts that would never ever again be filled. You would create a pain within those that you love that would last the rest of their lives. You may be feeling like a failure right now but I cannot imagine a greater mistake then having your last act on earth be one that causes intense pain for each and every person that you love. 3.) The pain will never end. I know it feels like the pain will never end. I know it feels like each and every moment is years long as you are so mired in the pain. I know that it feels as though you cannot tolerate it for even a moment longer. I know that there is an end to this pain, that will happen without death. I cannot tell you when that ends will happen but I can tell you that the end is there somewhere. You may have to work for it, you may have to get help or take medication or reach out when you want to stay silent, but the end of the pain is out there on the horizon. No pain lasts forever, even the most crushing of pains. 4.) You should keep your thoughts about harming yourself quiet. Of course your depression, that beast, wants you to stay silent. Your depression wants to end your life. The black beast wants nothing more than to have you lying in a cold grave. There is great shame around depression, anxiety and suicidality. However, every time one of us chooses to talk about it, we erase some of that shame and stigma. There is no need for you to suffer in silence. Choose to do the opposite of what the beast wants you to do. I'm asking you, I'm begging you, to pick up the phone and call one person and tell them what you're struggling with. I'm asking you to ask for help even though it may be the hardest thing you ever do I'm asking you to give this life another chance before you take your own life. 5.) You're not worthy of love or life. Everyone is worthy of love, no matter the mistakes they've made. And, everyone is worthy of living -- there is no qualification match to determine if you should be here. You might only see the negative things right now but if you could see inside the heads of those who love you(yes, there are people who love you -- stop letting the depression tell you that there aren't) you would see so many things about you that are wonderful. If you try to talk to a therapist, try a new medication, try some new things to change your thoughts... I think that you will start to see them, too. I'm asking you to try to kill the beast, the beast that has been lying to you and whispering awful things in your ear every waking moment. Because there is an end to this crushing pain, because the world needs YOU, because even though you've made mistakes there are people that love you and would be in indescribable pain if you were no longer here. I know that you are tired and weary. I know that just getting out of bed seems like an astronomical task. I'm just asking you to call someone you love, right this minute and tell them about the thoughts that you've been thinking about taking your own life. I'm begging you to try some different things and see if you can see the world through a different light. The world needs you. Yes, you. There is a purpose here that only you can fill. Twenty years ago, I nearly left the world by my own hands. I am so glad to still be here. I am happy (not always, but most days), I love life, I have people around me that love me and I am doing my best to make a difference in this world. I am here for a purpose, just like you are. Won't you join me on the other side of the pain? Please, don't leave us. We need you. 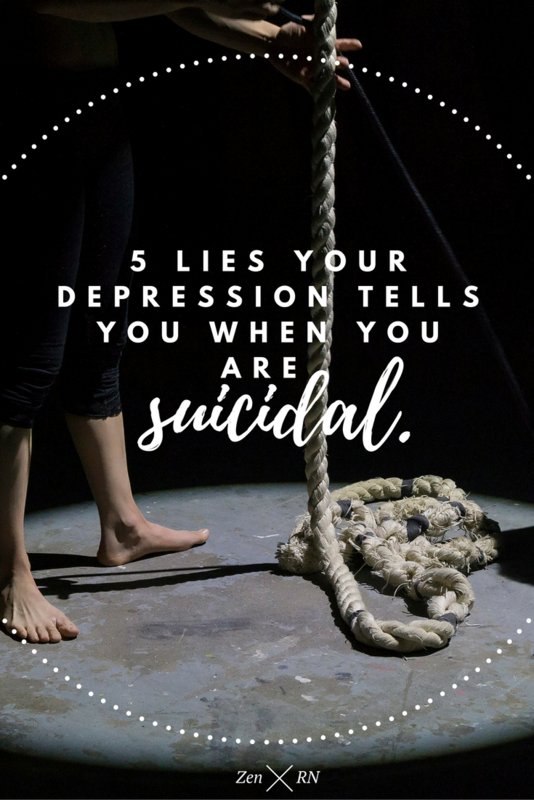 Won't you please stop listening to all of the lies that your depression is telling you and take the first step in your journey to the good things on the other side of this pain? Right this minute, I beg of you to call, text or message someone and tell them how you are feeling. If you cannot bring yourself to say this to someone you love, please use the information below. There is help for you. I swear it. You can call the National Suicide Prevention Hotline at 1-800-273-TALK (8255) or live chat with someone here. These resources are available 24/7. 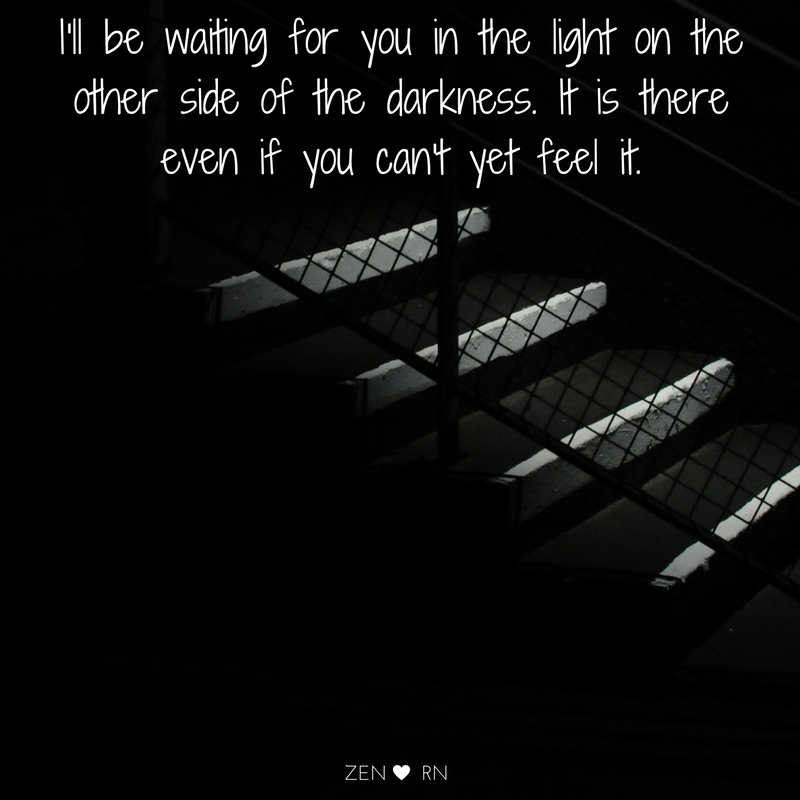 I'll be waiting for you in the light on the other side of the darkness. It is there even if you can't yet feel it. Readers -- if you have ever struggled with suicidality or know someone that attempted or completed suicide, I am asking you to comment below with "You are not alone," so that everyone who comes to this page feels a little less alone on a their dark journey that feels so painfully solitary. Thank you. This article appeared first on The Zen RN.